I love it when Israel responds to glorified skyrocket attacks by Hamas for occupying Palestinian land with air strikes. Nothing sums up the oppressor/oppressed equation in Palestine as much as a flattened neighborhood on the receiving end of high explosive group punishment. Israel's aircraft have struck a number of targets in Gaza after it vowed a severe response to rocket attacks on its soil. A Hamas commander died in an attack on a car and another militant was killed in a housing unit, both in Gaza City. A raid on a Hamas office also killed one person and injured at least 45. The attacks came as efforts to end five days of fighting between rivals Hamas and Fatah again appeared to fail. At least 40 people have now died. Correspondents say the rocket attacks into Israel appear to be an attempt to draw it into an internal Palestinian conflict. "Glorified skyrockets" don't kill and maim people. Qassam rockets do. Are you aware of smaller, less lethal rockets being launched somewhere? Figured you wouldn't have unmoderated comments posting stuff like this. Then Israel should stop stealing land. Well you paid for it after all Phil Goff gave the late Mister Arafat $500,000 to buy them matey! 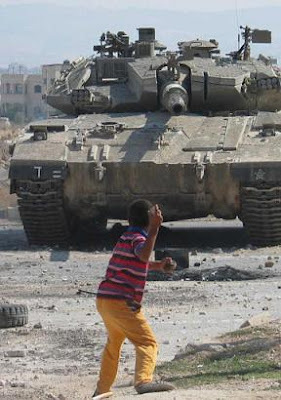 That little dude has more balls than the cowards in that tank. They probably blew him away and got medals for their bravery.